: Guard dog for property and livestock. : It is believed to descend from molosser dogs from the Middle East. On account of their size and courage they were used by tribes whose livelihood depended on livestock husbandry, thus performing a crucial role for this type of community. : Large sized dog, powerful, rustic, sober and calm. Outlines in head slightly convex, the general structure is rather longer than high (sub-longilinear). : An excellent farm and estate watch dog, it is also a very useful livestock protector, more vigilant at night, being very serious when guarding territory or any other property entrusted to it. : Voluminous tending to massive, in proportion to the size of the dog; wide at the rear of the skull, narrower and less convex in the forehead. The superior cranium-facial axes are moderately divergent. : Broad; rounded in both the longitudinal and transversal axes; superciliary arches not prominent; slight frontal furrow between and over the eyes; occipital protuberance not too pronounced; well muscled sides of the skull. : Oval, with tip slightly downwards and towards the rear part of muzzle; black coloured well open nostrils. : Nasal bridge straight, its cross section arched. 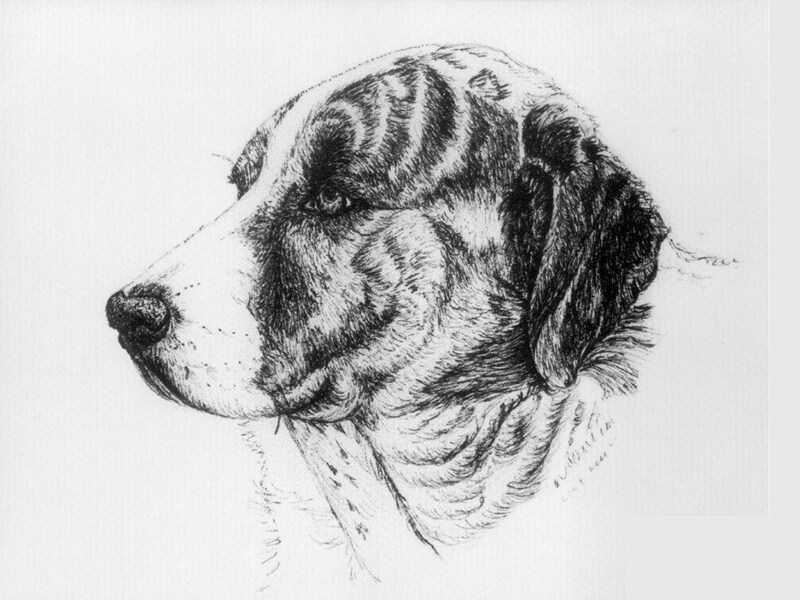 The muzzle has a wide and high base, tapering moderately towards the nose and is shorter than the skull. : Black, slightly rounded in front, overlapping, well cut; of medium thickness; showing a slight curve in the inferior profile. : Strong and well developed; scissors bite, pincer bite accepted. : Slightly evident with prominent masseteric area. : Small; elliptical; set almost level with the foreface; brown (preferably dark); dark pigmented lids; firm and adherent to the eyes. With a calm expression. : Medium set-on, with low mobility, folded and hanging. Small, with a narrow base and length equal to or slightly more than the width; Triangular and rounded at the tip. At attention they remain folded, rising at the base and folding vertically. : Well set into the shoulders; straight; short; strong; with even, single, longitudinal dewlap, proportioned to the size. : Strong, well muscled, slightly longer than the height at the withers, voluminous. : Straight, almost level; a slight slope from fore to rear is tolerated. : Not prominent, well connected to the neck. : Slightly sloping tending to horizontal. : Of medium length; straight and broad, well muscled. : Slightly sloping; of medium length; broad and muscled, in relation to the substance. : Chest: Broad; well let down to, or slightly below the elbow. Forechest: Broad, but not too evident. : Almost horizontal sternum; belly not tucked up, following the line of the sternum. : Set on at medium height following the croup; thick at the base, may be slightly curved or turned up at the tip, but no kink, long; at rest hangs down reaching at least the hock, preferably below it, in action it may rise and curl without resting on the top line. : Strong, wide apart, upright when seen from front and from profile. : Strong; of medium length; well developed and muscled, approximately 105º scapula-humerus angle. : Strong; of medium length; inclined and muscled. : Close to the thorax, neither turning in nor out; humerus-radius angle between 130º and 135º. : Vertical; long; strong and well muscled. : Thick; with good joints. : Of medium length; thick; slightly sloping. : Toes thick, tight (not splayed) and slightly arched (rounded); strong nails, coloured according to the coat colour; pads thick and tough. : Toes thick, tight (not splayed) and slightly arched; strong nails, coloured according to the coat colour; pads thick and tough. : Strong, wide apart, upright when seen from back and profile. : Long; broad; well muscled but not exaggerated; hip-femur angle approximately 105º. : Strong joint; in line with the body without turning out; femur-tibia angle between 125º and 130º. : Strong; moderately inclined; of medium length; well muscled. : Thick, of medium length, set at medium height; very slightly sloping; may have single or double dewclaws. : Heavy, slow, roll without exaggeration. : Thick, rather close fitting; internal mucous membranes partially or totally pigmented with black, external mucous membranes fully pigmented. : Short or of medium length, this being preferred; thick, straight and dense, evenly spread down to between toes. : Black, wolf grey, fawn or yellow, with or without brindling, always with white markings; or white with patches of these colours. Height: Males less than 66 cm or more than 75 cm. Females less than 64 cm or more than 71 cm.